For other uses, see Serpentine (disambiguation). Turned green serpentine from 1700-century. Necklace and earring set made from semiprecious stones. The spherical green beads are Russian serpentine. Also used are jasper (red) and fluorite (blue). Kaolinite is a clay mineral, part of the group of industrial minerals, with the chemical composition Al2Si2O5(OH)4. It is a layered silicate mineral, with one tetrahedral sheet of silica (SiO4) linked through oxygen atoms to one octahedral sheet of alumina (AlO6) octahedra. Rocks that are rich in kaolinite are known as kaolin or china clay. Serpentinite is a rock composed of one or more serpentine group minerals, the name originating from the similarity of the texture of the rock to that of the skin of a snake. Minerals in this group, which are rich in magnesium and water, light to dark green, greasy looking and slippery feeling, are formed by serpentinization, a hydration and metamorphic transformation of ultramafic rock from the Earth's mantle. The mineral alteration is particularly important at the sea floor at tectonic plate boundaries. Magnesium is a chemical element with symbol Mg and atomic number 12. It is a shiny gray solid which bears a close physical resemblance to the other five elements in the second column of the periodic table: all group 2 elements have the same electron configuration in the outer electron shell and a similar crystal structure. The serpentine group describes a group of common rock-forming hydrous magnesium iron phyllosilicate ((Mg, Fe)3 Si 2 O 5( OH )4) minerals, resulting from the metamorphism of the minerals that are contained in ultramafic rocks. They may contain minor amounts of other elements including chromium, manganese, cobalt or nickel. In mineralogy and gemology, serpentine may refer to any of 20 varieties belonging to the serpentine group. Owing to admixture, these varieties are not always easy to individualize, and distinctions are not usually made. There are three important mineral polymorphs of serpentine: antigorite, chrysotile and lizardite. Rock or stone is a natural substance, a solid aggregate of one or more minerals or mineraloids. For example, granite, a common rock, is a combination of the minerals quartz, feldspar and biotite. The Earth's outer solid layer, the lithosphere, is made of rock. Silicon is a chemical element with symbol Si and atomic number 14. It is a hard and brittle crystalline solid with a blue-grey metallic lustre; and it is a tetravalent metalloid and semiconductor. It is a member of group 14 in the periodic table: carbon is above it; and germanium, tin, and lead are below it. It is relatively unreactive. Because of its high chemical affinity for oxygen, it was not until 1823 that Jöns Jakob Berzelius was first able to prepare it and characterize it in pure form. Its melting and boiling points of 1414 °C and 3265 °C respectively are the second-highest among all the metalloids and nonmetals, being only surpassed by boron. Silicon is the eighth most common element in the universe by mass, but very rarely occurs as the pure element in the Earth's crust. It is most widely distributed in dusts, sands, planetoids, and planets as various forms of silicon dioxide (silica) or silicates. More than 90% of the Earth's crust is composed of silicate minerals, making silicon the second most abundant element in the Earth's crust after oxygen. The serpentine group of minerals are polymorphous, meaning that they have the same chemical formulae, but the atoms are arranged into different structures, or crystal lattices. Chrysotile, which has a fiberous habit, is one polymorph of serpentine and is one of the more important asbestos minerals. Other polymorphs in the serpentine group may have a platy habit. Antigorite and lizardite are the polymorphs with platy habit. In materials science, polymorphism is the ability of a solid material to exist in more than one form or crystal structure. Polymorphism can potentially be found in any crystalline material including polymers, minerals, and metals, and is related to allotropy, which refers to chemical elements. The complete morphology of a material is described by polymorphism and other variables such as crystal habit, amorphous fraction or crystallographic defects. Polymorphism is relevant to the fields of pharmaceuticals, agrochemicals, pigments, dyestuffs, foods, and explosives. Asbestos is a set of six naturally occurring silicate minerals, which all have in common, their asbestiform habit: i.e., long, thin fibrous crystals, with each visible fiber composed of millions of microscopic "fibrils" that can be released by abrasion and other processes. The minerals are chrysotile, amosite, crocidolite, tremolite, anthophyllite, and actinolite. Jewellery or jewelry consists of small decorative items worn for personal adornment, such as brooches, rings, necklaces, earrings, pendants, bracelets, and cufflinks. Jewellery may be attached to the body or the clothes. From a western perspective, the term is restricted to durable ornaments, excluding flowers for example. For many centuries metal, often combined with gemstones, has been the normal material for jewellery, but other materials such as shells and other plant materials may be used. It is one of the oldest type of archaeological artefact – with 100,000-year-old beads made from Nassarius shells thought to be the oldest known jewellery. The basic forms of jewellery vary between cultures but are often extremely long-lived; in European cultures the most common forms of jewellery listed above have persisted since ancient times, while other forms such as adornments for the nose or ankle, important in other cultures, are much less common. Hardstone carving is a general term in art history and archaeology for the artistic carving of predominantly semi-precious stones, such as jade, rock crystal, agate, onyx, jasper, serpentine, or carnelian, and for an object made in this way. Normally the objects are small, and the category overlaps with both jewellery and sculpture. Hardstone carving is sometimes referred to by the Italian term pietre dure; however, pietra dura is the common term used for stone inlay work, which causes some confusion. Their olive green colour and smooth or scaly appearance is the basis of the name from the Latin serpentinus, meaning "serpent rock," according to Best (2003). They have their origins in metamorphic alterations of peridotite and pyroxene. Serpentines may also pseudomorphously replace other magnesium silicates. Alterations may be incomplete, causing physical properties of serpentines to vary widely. Where they form a significant part of the land surface, the soil is unusually high in clay. 4). It is high in magnesium (Mg2+), reflecting the high proportions of magnesium-rich olivine, with appreciable iron. Peridotite is derived from the Earth's mantle, either as solid blocks and fragments, or as crystals accumulated from magmas that formed in the mantle. The compositions of peridotites from these layered igneous complexes vary widely, reflecting the relative proportions of pyroxenes, chromite, plagioclase, and amphibole. Antigorite is the polymorph of serpentine that most commonly forms during metamorphism of wet ultramafic rocks and is stable at the highest temperatures—to over 600 °C (1,112 °F) at depths of 60 km (37 mi) or so. In contrast, lizardite and chrysotile typically form near the Earth's surface and break down at relatively low temperatures, probably well below 400 °C (752 °F). It has been suggested that chrysotile is never stable relative to either of the other two serpentine polymorphs. Samples of the oceanic crust and uppermost mantle from ocean basins document that ultramafic rocks there commonly contain abundant serpentine. Antigorite contains water in its structure, about 13 percent by weight. Hence, antigorite may play an important role in the transport of water into the earth in subduction zones and in the subsequent release of water to create magmas in island arcs, and some of the water may be carried to yet greater depths. Soils derived from serpentine are toxic to many plants, because of high levels of nickel, chromium, and cobalt; growth of many plants is also inhibited by low levels of potassium and phosphorus and a low ratio of calcium/magnesium. The flora is generally very distinctive, with specialised, slow-growing species. Areas of serpentine-derived soil will show as strips of shrubland and open, scattered small trees (often conifers) within otherwise forested areas; these areas are called serpentine barrens. Most serpentines are opaque to translucent, light (specific gravity between 2.2–2.9), soft (hardness 2.5–4), infusible and susceptible to acids. All are microcrystalline and massive in habit, never being found as single crystals. Lustre may be vitreous, greasy or silky. Colours range from white to grey, yellow to green, and brown to black, and are often splotchy or veined. Many are intergrown with other minerals, such as calcite and dolomite. Occurrence is worldwide; New Caledonia, Canada (Quebec), US (northern California, Rhode Island, Connecticut, Massachusetts, Maryland and southern Pennsylvania),  Afghanistan, Britain (the Lizard peninsula in Cornwall), Ireland, Greece (Thessaly), China, Russia (Ural Mountains), France, Korea, Austria (Styria and Carinthia), India (Assam, and Manipur), Myanmar (Burma), New Zealand, Norway and Italy are notable localities. Serpentines find use in industry for a number of purposes, such as railway ballasts, building materials, and the asbestiform types find use as thermal and electrical insulation (chrysotile asbestos). The asbestos content can be released to the air when serpentine is excavated and if it is used as a road surface, forming a long term health hazard by breathing. Asbestos from serpentine can also appear at low levels in water supplies through normal weathering processes, but there is as yet no identified health hazard associated with use or ingestion. In its natural state, some forms of serpentine react with carbon dioxide and re-release oxygen into the atmosphere. The more attractive and durable varieties (all of antigorite) are termed "noble" or "precious" serpentine and are used extensively as gems and in ornamental carvings. The town of Bhera in the historic Punjab province of the Indian subcontinent was known for centuries for finishing a relatively pure form of green serpentine obtained from quarries in Afghanistan into lapidary work, cups, ornamental sword hilts, and dagger handles. This high-grade serpentine ore was known as sang-i-yashm or to the English, false jade, and was used for generations by Indian craftsmen for lapidary work. It is easily carved, taking a good polish, and is said to have a pleasingly greasy feel. Less valuable serpentine ores of varying hardness and clarity are also sometimes dyed to imitate jade. Misleading synonyms for this material include "Suzhou jade", "Styrian jade", and "New jade". New Caledonian serpentine is particularly rich in nickel. The Māori of New Zealand once carved beautiful objects from local serpentine, which they called tangiwai, meaning "tears". The lapis atracius of the Romans, now known as verde antique, or verde antico, is a serpentinite breccia popular as a decorative facing stone. In classical times it was mined at Casambala, Thessaly, Greece. Serpentinite marbles are also widely used: Green Connemara marble (or Irish green marble) from Connemara, Ireland (and many other sources), and red Rosso di Levanto marble from Italy. Use is limited to indoor settings as serpentinites do not weather well. Polished slab of bowenite serpentine, a variety of antigorite. Typical cloudy patches and veining are apparent. Lamellated antigorite occurs in tough, pleated masses. It is usually dark green in colour, but may also be yellowish, gray, brown or black. It has a hardness of 3.5–4 and its lustre is greasy. The monoclinic crystals show micaceous cleavage and fuse with difficulty. Antigorite is named after its type locality, the Geisspfad serpentinite, Valle Antigorio in the border region of Italy/Switzerland. Bowenite is an especially hard serpentine (5.5) of a light to dark apple green colour, often mottled with cloudy white patches and darker veining. It is the serpentine most frequently encountered in carving and jewellery. The name retinalite is sometimes applied to yellow bowenite. The New Zealand material is called tangiwai. Although not an official species, bowenite is the state mineral of Rhode Island, United States: this is also the variety's type locality. A bowenite cabochon featured as part of the "Our Mineral Heritage Brooch", was presented to U.S. First Lady Mrs. Lady Bird Johnson in 1967. Gymnite is an amorphous form of antigorite. It was originally found in the Bare Hills, Maryland, U.S., and is named from the Greek, gymnos meaning bare or naked. ↑ Rudler, Frederick William (1911). "Serpentine" . In Chisholm, Hugh. Encyclopædia Britannica . 24 (11th ed.). Cambridge University Press. pp. 675–677. ↑ "Serpentine definition in the Dictionary of Geology" . Retrieved 9 July 2018. ↑ "Serpentine: The mineral Serpentine information and pictures". www.minerals.net. Retrieved 4 April 2018. ↑ "Slate – The Delta Story: A Heritage To Be Preserved". JONES, Jeri L., presented to the Geological Society of America's Northeastern Section. March 2005. Archived from the original on July 14, 2011. Retrieved June 3, 2010. ↑ "Gymnite: Gymnite mineral information and data". www.mindat.org. Retrieved 4 April 2018. Garnierite is a general name for a green nickel ore which is found in pockets and veins within weathered and serpentinized ultramafic rocks. It forms by lateritic weathering of ultramafic rocks and occurs in many nickel laterite deposits in the world. It is an important nickel ore, having a large weight percent NiO. As garnierite is not a valid mineral name according to the Commission on New Minerals, Nomenclature and Classification (CNMNC), no definite composition or formula has been universally adopted. Some of the proposed compositions are all hydrous Ni-Mg silicates, a general name for the Ni-Mg hydrosilicates which usually occur as an intimate mixture and commonly includes two or more of the following minerals: serpentine, talc, sepiolite, smectite, or chlorite, and Ni-Mg silicates, with or without alumina, that have x-ray diffraction patterns typical of serpentine, talc, sepiolite, chlorite, vermiculite or some mixture of them all. Tremolite is a member of the amphibole group of silicate minerals with composition: ☐Ca2(Mg5.0-4.5Fe2+0.0-0.5)Si8O22(OH)2. Tremolite forms by metamorphism of sediments rich in dolomite and quartz. Tremolite forms a series with actinolite and ferro-actinolite. Pure magnesium tremolite is creamy white, but the color grades to dark green with increasing iron content. It has a hardness on Mohs scale of 5 to 6. 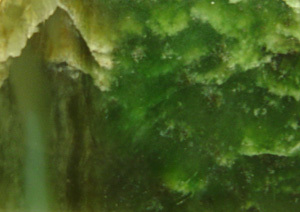 Nephrite, one of the two minerals of the gemstone jade, is a green variety of tremolite. Chrysoprase, chrysophrase or chrysoprasus is a gemstone variety of chalcedony that contains small quantities of nickel. Its color is normally apple-green, but varies to deep green. The darker varieties of chrysoprase are also referred to as prase. Artinite is a hydrated magnesium carbonate mineral with formula: Mg2(CO3)(OH)2·3H2O. It forms white silky monoclinic prismatic crystals that are often in radial arrays or encrustations. It has a Mohs hardness of 2.5 and a specific gravity of 2. Anthophyllite is an amphibole mineral: ☐Mg2Mg5Si8O22(OH)2 (☐ is for a vacancy, a point defect in the crystal structure), magnesium iron inosilicate hydroxide. Anthophyllite is polymorphic with cummingtonite. Some forms of anthophyllite are lamellar or fibrous and are classed as asbestos. The name is derived from the Latin word anthophyllum, meaning clove, an allusion to the most common color of the mineral. Serpentine soil is mostly derived from ultramafic rocks; In particular, serpentinite, a rock formed by the hydration and metamorphic transformation of peridotite. Peridotite is an ultramafic rock from the Earth's upper mantle. Serpentinite is composed of the mineral serpentine; the two terms are often used to mean the rock and soil. Bowenite is a hard, compact variety of the serpentinite species antigorite, (Mg3(OH)O4Si2O5). Classed as semi-precious gemstone it has been used for tools, weapons and jewellery by the Māori in New Zealand, and for jewellery by Fabergé. Deposits are found in several places around the world including Afghanistan, China, New Zealand, South Africa and the United States. It typically ranges in colour from dark green to light olive green, and in shades approaching yellow. Bowenite was named by James D. Dana in 1850 after George T. Bowen, who analyzed it in 1822. Asbestiform is a crystal habit. It describes a mineral that grows in a fibrous aggregate of high tensile strength, flexible, long, and thin crystals that readily separate. 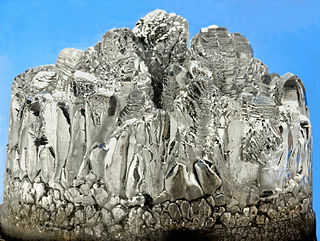 The most common asbestiform mineral is chrysotile, commonly called "white asbestos", a magnesium phyllosilicate part of the serpentine group. Other asbestiform minerals include riebeckite, an amphibole whose fibrous form is known as crocidolite or "blue asbestos", and brown asbestos, a cummingtonite-grunerite solid solution series. Zaratite is a bright emerald green nickel carbonate mineral with formula Ni3CO3(OH)4·4H2O. Zaratite crystallizes in the isometric crystal system as massive to mammillary encrustations and vein fillings. It has a specific gravity of 2.6 and a Mohs hardness of 3 to 3.5. It has no cleavage and is brittle to conchoidal fracture. The luster is vitreous to greasy. Hellyerite, NiCO3·6(H2O), is an hydrated nickel carbonate mineral. 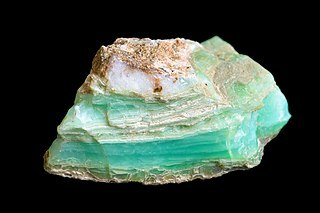 It is light blue to bright green in colour, has a hardness of 2.5, a vitreous luster, a white streak and crystallises in the monoclinic system. The crystal habit is as platy and mammillary encrustations on its matrix. Heazlewoodite, Ni3S2, is a rare sulfur-poor nickel sulfide mineral found in serpentinitized dunite. It occurs as disseminations and masses of opaque, metallic light bronze to brassy yellow grains which crystallize in the trigonal crystal system. It has a hardness of 4, a specific gravity of 5.82. Heazlewoodite was first described in 1896 from Heazlewood, Tasmania, Australia. San Benito Mountain is the highest mountain in the Diablo Range of California. The highest point is at an elevation of 5,267 feet (1,605 m). The rock is composed of asbestos (chrysotile), an ultramafic rock. It weathers to produce serpentine soils with characteristically low levels of nutrients like nitrogen, phosphorus, potassium, and calcium, and high levels of magnesium and heavy metals including nickel and chromium. This means little vegetation grows in the area though there are some plants that only grow on such soils like the local endemic San Benito evening primrose. Some of the highest peaks are clad in a unique pine and incense cedar forest. Balangeroite is found in one of the most important chrysotile mines in Europe, the Balangero Serpentinite. Hence, it is usually mistaken as an asbestiform in an assemblage of other mineral phases like chrysotile, magnetite and Fe-Ni alloys. However, Balangeroite does not lead to serious health problems caused by asbestos fibers. Népouite is a rare nickel silicate mineral which has the apple green colour typical of such compounds. It was named by E Glasser in 1907 after the place where it was first described (the type locality), the Népoui Mine, Népoui, Nouméa Commune, North Province, New Caledonia. The ideal formula is Ni3(Si2O5)(OH)4, but most specimens contain some magnesium, and (Ni,Mg)3(Si2O5)(OH)4 is more realistic. There is a similar mineral called lizardite in which all of the nickel is replaced by magnesium, formula Mg3(Si2O5)(OH)4. These two minerals form a series, that is to say intermediate compositions are possible, with varying proportions of nickel to magnesium. 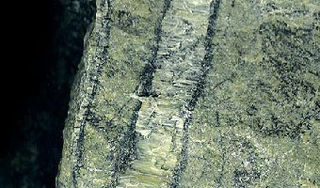 The Merlis Serpentinites are an aligned group of small serpentinite outcrops in the northwestern French Massif Central. Their parent rocks were peridotites from the upper mantle. Millerite is a nickel sulfide mineral, NiS. It is brassy in colour and has an acicular habit, often forming radiating masses and furry aggregates. It can be distinguished from pentlandite by crystal habit, its duller colour, and general lack of association with pyrite or pyrrhotite. The Staten Island Serpentinite locality is a southward extension of the New England Uplands, adjacent to the Manhattan Prong. It includes Todt Hill on Staten Island, which is the highest point along the Atlantic Seaboard south of Maine, at 410 feet above sea level. "Todt" is a Dutch word meaning "dead." This hill perhaps received its name from the Dutch settlers because the hilltops overlooking The Narrows consisted of scattered treeless rocky exposures. The chemical character of the bedrock was, in part, the reason for this. Much of Staten Island is covered by the Harbor Hill moraine, the terminal moraine of the last Wisconsin Stage glacier. However, ledges of bedrock consisting of serpentinite are exposed throughout the upland areas on Staten Island. Grymes Hill, the second highest point on Staten Island and just a few miles from Todt Hill has similar bedrock characteristics. Serpentine, the dominant mineral in serpentinite, is rich in magnesium, an element that most plants cannot tolerate in high concentrations. The enrichment of magnesium in the thin serpentine soil covering the glacier-scoured hilltops is probably responsible for the original barren exposures on Todt Hill. Wikimedia Commons has media related to Serpentine .